Within health systems, drugs are supplied in myriad forms requiring varying degrees of manipulation for proper patient administration. For its part, the Institute for Safe Medication Practices (ISMP) indicates in their safe practice guidelines that to the maximum extent possible, commercially prepared, premixed parenteral products and unit dose syringes are to be used versus manually compounded sterile products.1 Deemed ready-to-administer (RTA), as they do not require additional manipulation or preparation for administration, the Centers for Medicare & Medicaid Services (CMS) has indicated in their nursing conditions of participation that whenever possible, medications are to be dispensed in the most RTA forms available from the manufacturer, or, if feasible, in pharmacy-repackaged unit dose.2 These guidelines and regulations create a clear picture that hospital pharmacy departments should make every effort to provide RTA forms of compounded medications to administering clinicians. RTA: If the RTA syringe is not used during an emergency, it can be returned to stock for future use within the product’s BUD. Outsourced RTA syringes typically have BUDs that range from 30 to 90 days at room temperature. Traditional Methods: The drug waste affiliated with emergency medications can be significant. One study demonstrated a 47% loss ratio with ephedrine and an 84% loss ratio with atropine.8 Furthermore, some drug vials may contain more than one dose, but are intended only for a single patient, thus increasing the level of wasted drug if not used. RTA: Due to the general ability to reuse non-administered RTA syringes, drug waste can be decreased significantly. Of note, careful balance of periodic automatic replenishment (PAR) levels increases in importance, as RTA syringes have shorter BUDs compared to drug vials. 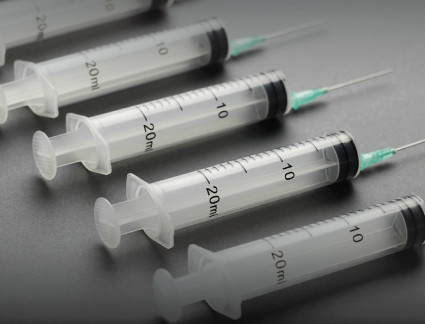 RTA: Syringes provided in RTA forms can be custom labeled to meet USP General Chapter <797> standards, including use of Tall-Man lettering, ASTM color coding, and other formatting to prevent look-alike errors. Traditional: Reconstituting drugs from vials using a syringe and needle can be a laborious task. For certain medications, the time for proper dilution of reconstituted lyophilized powder may exceed 20 minutes. RTA: Syringes provided in RTA format require no further manipulation and are ready to be attached to a device/line for administration to the patient, saving the end-user valuable time that can be reallocated to direct patient care. Our institution, Moses H. Cone Memorial Hospital in Greensboro, North Carolina, has developed methods to identify drug RTA supply issues in advance of a particular drug product being recognized by the FDA as on shortage. For example, our pharmacy purchasing agents are attuned to any supply fluctuations for a specific drug at the wholesaler level, which could be indicative of an unmet demand, preceding a shortage. Thus, the input of our pharmacy purchasing agents is vital to our drug shortage mitigation strategy; these employees are charged with communicating any pre-shortage trends to the pharmacy administration team for proper clinical and/or operational changes as soon as possible. In addition to supply shortages, recalls can impact medication availability. There are several reasons a 503B pharmacy or manufacturer will recall a medication. Such scenarios encourage the pharmacy team to expand its 503B-certified portfolio to ensure that backup or alternative RTA syringes can be acquired. An additional challenge to maintaining sufficient stock is the loss of extended dating should the outsourced compounder experience delays with their product shipments. Delayed shipments make it challenging to maintain PAR levels that can both meet patient demand and avert stockouts. Any shipping delay can result in temporary in-house shortages and is disruptive to patient care. This issue can be especially challenging to manage when the facility relies on multiple outsourced providers. In light of the challenges related to the maintenance of a steady RTA drug supply chain, some facilities may consider insourcing the compounding of syringes within the hospital pharmacy-compounding suite. While there are many benefits related to insourcing, careful consideration needs to be taken given the potential for risk/liability for patient harm, regulatory noncompliance, and the scrutiny of FDA inspection. Nonetheless, benefits may include reduction of overall drug cost, increased 340B capture/savings, label customization flexibility, maximization of BUD through elimination of shipping time, the ability to rapidly adapt supply to demand, and more. For certain high-use RTA syringes, insourcing also requires additional consideration of the automation and production technology necessary to ensure the syringes are prepared accurately and efficiently, while also mitigating the risk of repetitive-stress injury for compounding technicians. Certain automation and IV compounding technology (ie, IV robotics) can help minimize human interaction in the compounding process, and thus reduce contamination opportunities during the compounding process. If extended BUDs are being considered, such a program would need to be coupled with a robust quality assurance (QA) program and end-product testing (ie, sterility, stability per method, suitability, endotoxin, particulate matter, etc) as required by USP standards and other regulations. To justify necessary financial investments to the C-suite, it is prudent to perform a comprehensive and detailed analysis of the potential financial savings of insourcing, in addition to communicating the value delivered to the patient through increased quality, safety, and service. While reducing costs has the largest impact on the patient/value equation, the main driver for insourcing should focus on the added quality and safety enabled by a robust QA program. In 2017, Moses H. Cone expended significant financial resources on RTA syringes sourced from 503B facilities. This investment would have been even higher if drug shortages had not affected availability from these 503Bs. In order to analyze the potential financial impact of insourcing many of these RTAs, our first step was to compare the total outsourcing costs to the costs of obtaining drug ingredients and necessary supplies for insourcing. For this analysis, we only analyzed the costs of sterile-to-sterile compounding, as our hospital does not perform high-risk compounding. Our initial analysis indicated that we could save over 50% of our total costs by insourcing RTA syringes. Once the decision was made to pursue robotic IV compounding technology, we needed to determine what device to purchase and how many to select. With multiple options for robot-assisted compounding on the market, we considered our pharmacy’s physical space limitations, the size of each robot, their individual production capacities, as well as the reported accuracy, downtime requirements, and syringe/bag size requirements. Determining the number and makeup of staff necessary to run the robotics at an optimal state is equally important. This depends largely on the volume of materials that can be loaded into the robot for each cycle and the number and nature of tasks necessary to support the robot. For example, it may be more efficient to complete certain dilutions, such as ephedrine, manually before the robot draws up the final volume into an RTA syringe. The added risk of error and contamination with manual manipulations must be balanced against the efficiency gained. The exact mix of medications that should be compounded via the robot is an additional consideration. It is unlikely that an institution will be able to produce all IV compounded medications via robotics, so it may be prudent to outsource certain medications. Some RTA syringes that we plan to insource immediately include ephedrine, neostigmine, succinylcholine, and glycopyrrolate. Other medications, such as phenylephrine and atropine, may remain outsourced for the near future. The cost savings, quantity of use, and cost of stability and sterility testing for each medication will affect this decision. The decisions as to which medications will be compounded by the robot will depend on cost and quantity of use. Our initial financial analysis revealed that utilizing an IV compounding robot to insource our hospital’s RTA syringes would lead to significant cost savings. 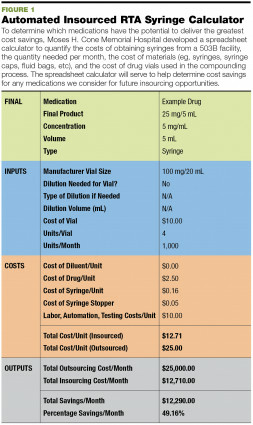 To determine which medications have the potential to deliver the greatest cost savings, we developed a spreadsheet calculator to quantify the costs of obtaining syringes from a 503B facility, the quantity needed per month, the cost of materials (eg, syringes, syringe caps, fluid bags, etc), and the cost of drug vials used in the compounding process (see FIGURE 1). In addition, the spreadsheet calculator will serve to help determine cost savings for any medications we consider for future insourcing opportunities. This exercise revealed that some medications, such as ephedrine and glycopyrrolate, could produce considerable cost savings, while other medications, such as atropine, cost about the same as outsourcing. This calculator does not take into account the unmeasured costs that go into supporting insourcing, such as staffing, training, facility cleaning, environmental monitoring, competency testing, and documentation management. These unmeasured costs should be built into an initial pro forma. To determine quantity of use, we analyzed our 503B outsourcing data from the previous 12 months. Unfortunately, recent drug shortages made it difficult to establish an accurate amount for each medication that had been outsourced. As such, we made an assumption of the true quantity using metrics that preceded the shortages. Another factor to consider is extended BUD for robot-prepared medications. Without extended BUD testing, these medications can only be stored for 48 hours for low-risk compounds and 30 hours for medium-risk compounds, per USP <797>. To extend BUD beyond USP <797> dating, certain required tests must be performed (ie, stability indicating assay, sterility, endotoxin, etc) based on the specific formulation. Extending BUD can help reduce waste given that the majority of RTA syringes we stock are used in the operating rooms, where they may be stored for days or weeks. The RTA syringes that are currently being outsourced have extended BUDs of anywhere from 30 to 90 days. Once all of these factors were analyzed, we focused our go-live strategy on the medications that would yield the greatest cost savings. We also wanted to limit the number of medications compounded by the robot until technicians and pharmacists became comfortable with the process and workflow. Following the initial go-live period, our goal is to ramp up to full capacity within 3 months. At maximum capacity, we forecast a production of approximately 10,000 doses per month compounded using robotics. Key for our insourcing program was the establishment of a quarantine program for batched products awaiting sterility testing; the turnaround time for this process is at least 14 days using USP <71> methodology.14 There are rapid microbiological methods that could also be considered, and guidance for validating such tests is provided in USP <1223>.15 While sterility testing is in process, the medications would be quarantined and stored in a specified location (ie, not released for patient use). Although USP <797> does not require final sterility testing results prior to dispensing,5 a lack of final sterility testing results could increase the risk for dispensing non-sterile and adulterated drug to a patient. A quarantine program notwithstanding, written procedures need to be in place should a patient ever receive a product that failed sterility testing, and immediate notification and recall is required. Both the patient and physician need to be notified immediately. One challenge to establishing a quarantine program is creating an appropriate storage location.16 For our current situation, we only require room temperature storage, but should other medications requiring refrigerator or freezer storage be insourced, that would require adding medical-grade refrigeration into the quarantine workflow. An additional storage consideration involves managing the number of syringe doses that will be prepared over the course of 2 weeks when target optimization is achieved; in our case, this is 2000-3000 syringes. One potential storage strategy involves large plastic totes held in a segregated storage area within the main pharmacy but outside the IV cleanroom. Ideally, segregated areas should be located away from both the compounding workflow and the main pharmacy workflow to prevent any syringes from being accidently released into the dispensing stream. Staff training is an important component of any quarantine program. All pharmacists, pharmacy technicians, and ancillary staff must understand that quarantined medications cannot be released for patient use until sterility tests prove they are safe. Part of this process is ensuring the storage area is clearly and obviously labeled for quarantine. Furthermore, pharmacy management must ensure all staff members understand the need to quarantine products and be trained on the entire workflow from initial production to final release from quarantine for patient use. Proper documentation of each step also must be performed. In order to rapidly optimize insourcing of RTA syringes, one pharmacist was designated to lead the implementation and ongoing QA processes. A pharmacist dedicated to QA pursuits is responsible for ensuring all proper documentation and regulatory requirements are completed. Primary responsibilities include overseeing the IV robotics program, evaluating QA testing, serving as liaison between the institution and the vendor, and overseeing the quarantine program. In addition, this role is charged with auditing the quarantine process and continuously optimizing the best mix of medications to insource based on fluctuating costs and quantities of use. The use of RTA syringes at our institution has already provided numerous benefits to pharmacists, technicians, nurses, and patients. However, purchasing RTA syringes can require a significant financial investment. As such, insourcing the process through IV robotics will allow us to provide RTA syringes in a cost-effective and safe manner. We plan to continue optimizing this process, and the production and provision of safe, quality products via IV compounding robot technology will remain a top priority. This new process will allow us to continue to provide the excellent care that RTA syringes enable while simultaneously maintaining control over supply and reducing drug costs for patients. Furthermore, additional drug cost savings may be realized in the future as some of the drug ingredients used to produce the syringes may be 340B eligible in certain administered locations. Kevin N. Hansen, PharmD, MS, BCPS, the assistant director of pharmacy at Moses H. Cone Memorial Hospital, provides oversight and leadership for pharmaceutical compounding and perioperative services pharmacy. He graduated from the Lake Erie College of Osteopathic Medicine with a Doctor of Pharmacy degree and received an MS in Pharmaceutical Sciences from the University of North Carolina Eshelman School of Pharmacy. Kevin’s professional interests include sterile compounding, quality assurance, and data analytics. Kai Kang, PharmD, is a PGY2 health-system pharmacy administration resident at Cone Health. He graduated from the University of North Carolina (UNC) Eshelman School of Pharmacy with a Doctor of Pharmacy degree and is currently pursuing an MS in Pharmaceutical Sciences at the UNC Eshelman School of Pharmacy. Kai’s professional interests include pharmacy operations, health care automation and technology, and supply chain management. Institute for Safe Medication Practices (ISMP). ISMP Guidelines for Safe Preparation of Compounded Sterile Preparations (2016 revision). www.ismp.org/guidelines/sterile-compounding. Accessed October 8, 2018. Institute for Safe Medication Practices (ISMP). ISMP Safe Practice Guidelines for Adult IV Push Medications (2015). www.ismp.org/guidelines/iv-push. Accessed October 8, 2018. Apfelbaum JL, Macario A, Aveyard C, et al. Outsourcing Anesthesia Preparations, Part II: Balancing Costs, Efficiency, and Quality Care. Anesthesiology News and Pharmacy Practice News (Special Report). January 2010. Centers for Medicare & Medicaid Services (CMS): Center for Clinical Standards and Quality/Survey & Certification Group. Revised Hospital Guidance for Pharmaceutical Services and Expanded Guidance Related to Compounding of Medications. www.cms.gov/Medicare/Provider-Enrollment-and-Certification/SurveyCertificationGenInfo/Downloads/Survey-and-Cert-Letter-16-01.pdf. Accessed October 8, 2018. The United States Pharmacopeia. Pharmaceutical compounding—sterile preparations (general information chapter 797). The United States Pharmacopeial Convention; 2013. McDowell SE, Mt-Isa S, Ashby D, et al. Where errors occur in the preparation and administration of intravenous medicines: a systematic review and Bayesian analysis. Postgrad Med J. 2010;86:734-738. Flynn EA, Pearson RE, Barker KN. Observational study of accuracy in compounding i.v. admixtures at five hospitals. Am J Health-Syst Pharm. 1997;54(9):904-912. Lejus C, Blanloeil Y, Oudot M, et al. Atropine and ephedrine: a significant waste in the operating theatre. Anaesthesia. 2012(67):294-308. Grissinger M. Reducing errors with injectable medications: unlabeled syringes are surprisingly common. P T. 2010;35(8):428-451. US Department of Health and Human Services. Food and Drug Administration. Compounded Drug Products that are Essentially Copies of Approved Drug Products Under Section 503B of the Federal Food, Drug, and Cosmetic Act. Guidance for Industry (January 2018). www.fda.gov/downloads/Drugs/GuidanceComplianceRegulatoryInformation/Guidances/UCM510153.pdf. Accessed October 18, 2018. FDA Drug Shortage Database. www.accessdata.fda.gov/scripts/drugshortages/default.cfm. Accessed October 18, 2018. Bekri S, Dupart PC. Insourcing IV Compounding with Robotics. Pharm Purch Prod. 2017;14(3):S1-S2. Webster, DF. Maximizing Automation in the IV Compounding Process. Pharm Purch Prod. 2017:14(6):10-16. The United States Pharmacopeia. Sterility tests (general information chapter 71). The United States Pharmacopeial Convention; 2016. The United States Pharmacopeia. Validation of alternative microbiological methods (general information chapter 1223). The United States Pharmacopeial Convention; 2008. Belisle CD, Kwok KK. A Quarantine Program for Compounded Products. Pharm Purch Prod. 2016;(13)7:3-4.